This guest post was written and photographed by Paula Lee, who is new to Korea and is currently studying Korean and exploring the landscape. You can follow her adventures at : http://paulainseoul.tumblr.com. If you would like to contribute to Seouleats shoot me an email at seouleats at gmail dot com. It has only been a few weeks since I moved to Korea from the States and it just so happens that I arrived right smack in the middle of the holiday season. This is my very first Christmas here in South Korea and so far I have found Korean Christmas to be quite festive and mouth watering. Its impossible to avoid Christmas back in the States. Drive by a residential street and you are bound to spot a few Christmas trees through living room windows or hear Mariah Carey is singing about how she wants you for Christmas on the radio. Every mall has a miniature North Pole where kids can share their wish list with Santa. 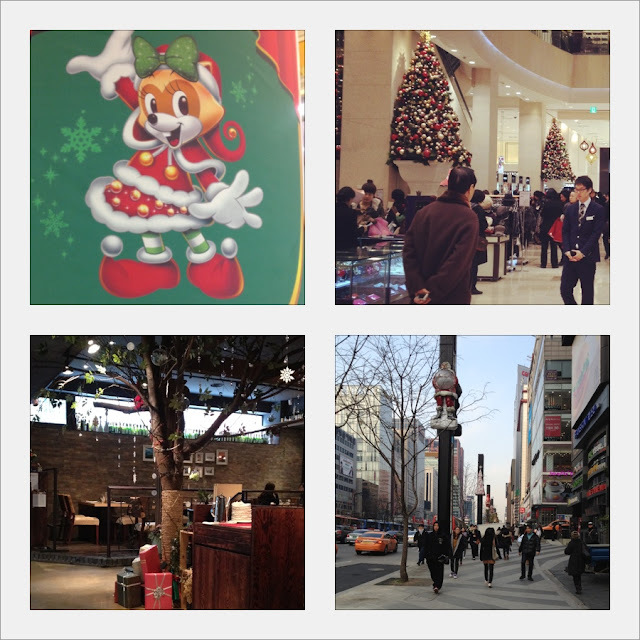 So when I arrived to Seoul my initial thoughts were that Christmas is definitely not a big deal in Asia. I should have expected this as most Western holidays in Asia get put in the back seat. There's no rush to buy Christmas gifts or to go home and decorate the window. Most commercial establishments, however, have started to embrace Christmas. When I walked through the streets of Seoul and store windows lined with tinsel and street poles decorated, I definitely felt like Christmas was near. Apart from the lights and decorated windows, my favorite Christmas trend in Korea though has to be the holiday food. It seems as though Koreans have embraced Christmas as a time for eating and I am incredibly excited about this. While I have noticed fancy restaurants offering Christmas dinners, I feel as though this trend is mostly limited to desserts. It is almost impossible to walk into a cafe or bakery and not see any food specially made for the holidays. Cafes have holiday themed drinks and I thoroughly enjoyed going to my local Dunkin Donuts and seeing Christmas donut cakes. Whenever I see these delectable desserts I can't help but purchase one. Didn't you know? Donuts are totally Christmas food. In my opinion, food is the great equalizer and I believe that’s why Koreans have turned to food to spread Christmas cheer. There is definitely no better way to bring people together or get people into a festive mood than through food. As you are being tempted by all the delicious holiday foods remember to be safe and warm. Merry Christmas to all...and to all a good night!